Zion Market Research has published a new report titled “Continuous Basalt Fiber Market for Molded Materials, Transportation, Electronics, Building & Construction and Other Applications: Global Market Perspective, Comprehensive Analysis and Forecast, 2015 – 2021.” According to the report, global continuous basalt fiber market was valued at over USD 68.41 million in 2015 and is expected to reach USD 121.19 Million in 2021, growing at a CAGR of slightly above 10.7% between 2016 and 2021. Basalt fiber is a material made up of extremely fine fibers of basalt It is manufactured by melting basalt rocks at high temperatures and processing them according to the needs of the end user industry. It is related to carbon fiber and fiberglass, having superior physicomechanical properties than fiberglass, but basalt fiber is much cheaper than carbon fiber. In aerospace and automotive industries, basalt fiber is used as a fireproof textile and can also be used as a composite to produce products such as camera tripods. Basalt as a fiber used in FRPs (fiber reinforced polymers) and structural composites. It is getting a lot of attention due to its high temperature and abrasion resistance. The global continuous basalt fiber market is expected to grow at slow but steady CAGR during the forecast period. Rise in use of basalt fiber in applications such as molded materials, transportation, electronics, building & construction etc., are key factors driving the demand for continuous basalt fiber. Rapidly growing population has been resulted into increased number of transportation, daily use electronic equipment, buildings etc. Building and construction dominated the global continuous basalt fiber market with around 37% share of the market in 2015. However, transportation, electronics etc applications expected to exhibit fastest growth rate (CAGR) as compared to building and construction application in the years to come. Moreover, use of continuous basalt fiber in other applications like sports equipment, defense, space and aeronautic components is also expected to boost the demand for continuous basalt fiber. 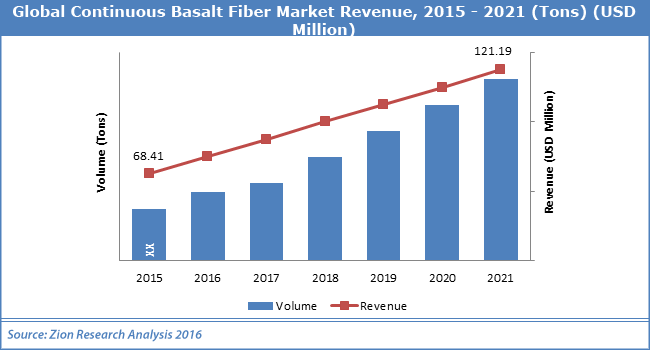 North America was the largest regional market for continuous basalt fiber in 2015. It accounted for around 40% share of the global market in 2015. Demand for continuous basalt fiber is mainly driven by strong demand from North America because of various application areas of continuous basalt fiber. In addition, high expenditure on defense and sports equipment is expected to propel market growth in the region during the forecast period. However, Asia Pacific is expected to exhibit the fastest growth in during the forecast period. Global continuous basalt fiber market is highly competitive, with the presence of well-established global vendors. Some prominent market players operating in this market includes Basaltex, Sudaglass Fiber Technology, Kamenny Vek, Zhejiang GBF Basalt Fiber Co., Ltd, Technobasalt, Shanxi Basalt Fiber Technology Co., Ltd, JiangSu TianLong Continuous Basalt Fiber High-tech Co., Ltd., GMVChina, Mafic SA and Mineral 7.